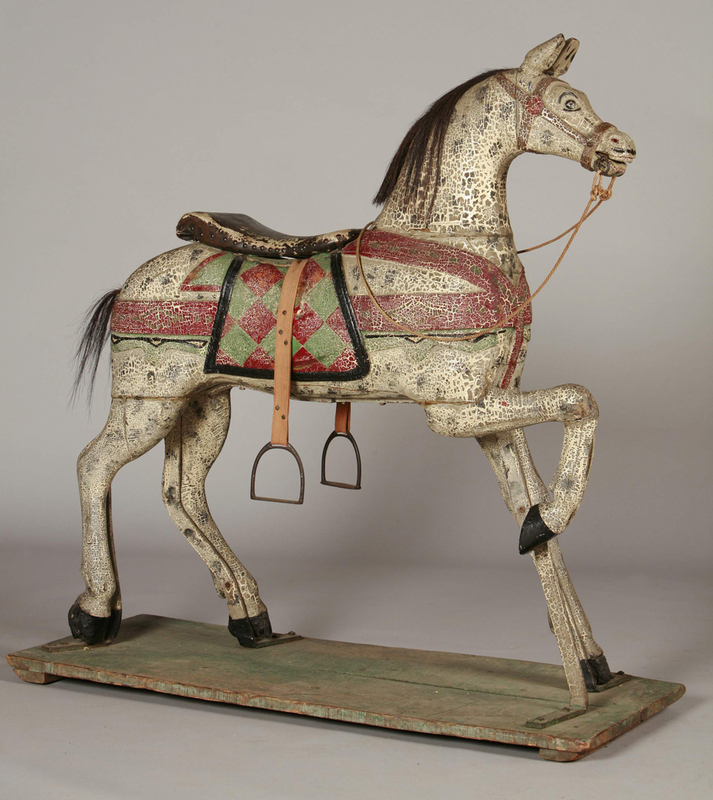 With Americana Week well underway, several notable big ticket items have already been sold all over town from paintings to a $500,000+ chest at antiques shows to auctions but let’s instead focus on antique toys. Once the stuff of childhood, well-preserved and finely-crafted toys are highly prized by collectors today. Over at Stella Show Mgmt Co.’s Antiques at the Armory show, at the 69th Regiment Armory January 20–22, several dealers have saved up fine examples to bring to this show. Robert Snyder and Judy Wilson, Wiscasset, Maine, will offer this Buddy L bus in untouched condition at the show. Measuring 29 inch es long, the bus has kept all its decals intact and is in great paint. Buddy L is among the top names in pressed steel toys (mainly vehicles), one might even say the company was the “king of the road.” Fred Lundahl started making toy vehicles in 1921 for the Moline (Ill.) Pressed Steel Company and named the Buddy L for his son. Trains, trucks, buses and construction vehicles were very popular and many early examples were large and tough enough for a small child to ride. For more information, www.snyderwilsonantiques.com or 207-882-4255. 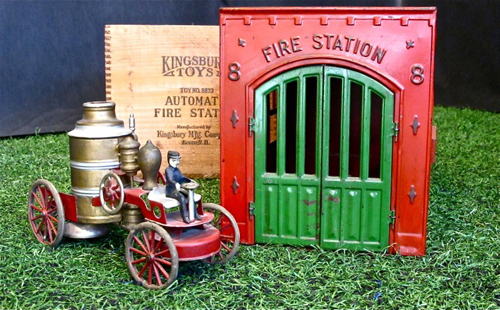 Scott Bassoff and Sandy J acobs, Swampscott, Mass., will also feature a fine toy in their booth at the Armory show: a Kingsbury toy fire station and fire truck that come with their original box. Kingsbury cast iron toys were produced in Keene, N.H., from about 1880 until 1942 when the production machines switched to aiding the wartime effort. Kingsbury toys were noted for their fine details and seemed so realistic that an early magazine ad touted Kingsbury toys as “so life-like they seem turned small by magic.” For more information, www.SandyJacobsAntiques.com or 603-801-5532. While we’re talking about child’s playthings, Thurston Nic hols American Antiques, Breinigsville, Penn., specializes in fine Eighteenth and Nineteenth Century inches tall. While this horse won’t be in the dealer’s booth this time around, no doubt other fine examples of Americana will. For more information, www.thurstonnichols,com or 610-972-4563. The show opens this Friday, January 20, and runs through Sunday. For show information, www.stellashows.com or 973-808-5015.